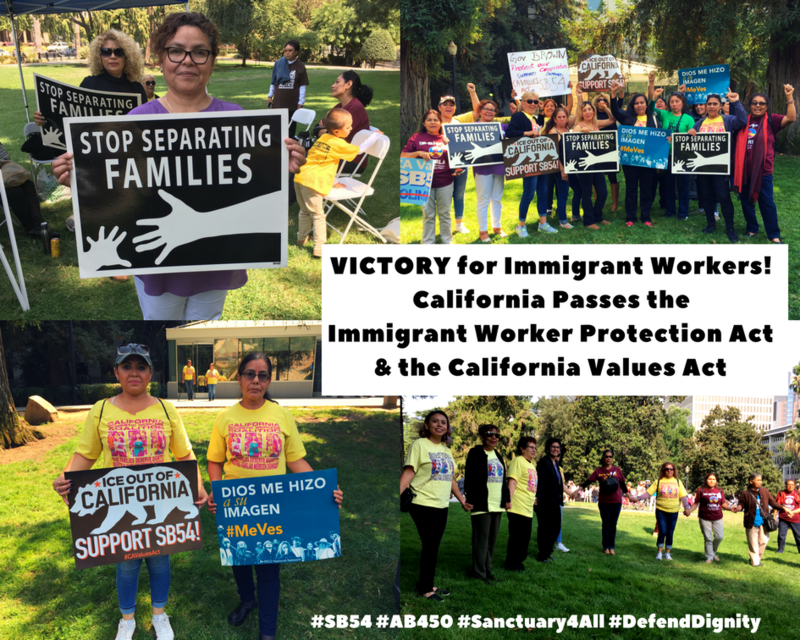 Victory for Immigrant Women Workers in California! Today, after months of local organizing, mobilizing statewide actions to Sacramento, and sharing the heartbreaking testimonies of family separation and fear in order to speak real truth to power, immigrant working class families have made history: Governor Jerry Brown signed SB 54 the California Values Act and AB 450 the Immigrant Worker Protection Act into law! These landmark policies are victories for the people of California, ensuring sanctuary and protection from retaliation and mass deportations. The California Domestic Worker Coalition celebrates the passage of these two bills on our 2017 Defending Dignity Platform, and we are honored to lift up the experiences and stories of immigrant working women who represent the majority of domestic workers across the state. In this political moment in which working-class immigrant communities are facing ongoing attacks, we rise above the fear and unite to protect and assert our rights. Together, we advance the dignity and well being of immigrant workers and their families. We applaud California for enacting policies that will lead the rest of the country in defending the dignity of immigrant workers! SB 54 (Senate Pro Tem De Leon): The California Values Act ensures that State and local law enforcement agencies, school police, and security departments do not engage with nor provide resources to support immigration enforcement processes. For more information about SB 54 protections click here. AB 450 (Chiu): The Immigrant Worker Protection Act protects workers from disruptive workplace raids by immigration enforcement. It requires a warrant and subpoena for ICE and further empowers the labor commissioner to protect workers in current claims processes from immigration proceedings.